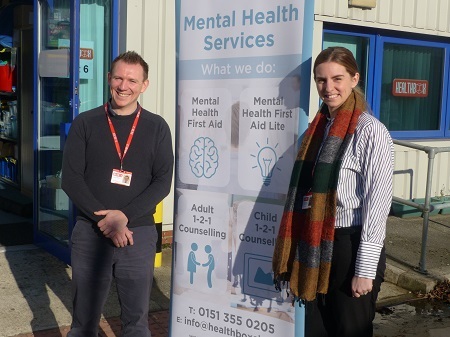 Cheshire West and Chester Council is funding increased access to counselling services through an initiative providing support for those in need in Ellesmere Port and Winsford. The Council has commissioned Healthbox CIC to deliver an extended counselling service that utilises student counsellors overseen by experienced, qualified counsellors. This service enables easy and fast access to residents within the two areas experiencing lower level mental health issues. The triage model allows us to provide appropriate counselling therapies to suitable clients while referring more complex cases to our local NHS Trust. The service is a great example of integrated care between the council, third sector provision and the NHS. Laura Turner, (Counselling Service Lead) of Healthbox CIC, said: “Client referrals come from a range of partners including the Work Zones or local GPs and are picked up by a qualified counsellor from our team for an initial assessment. Clients are then allocated to the most appropriate trainee counsellor and model of counselling they specialise in. “We offer open ended counselling, once a week for 50 minutes, with a review at session six. The individualised, holistic approach is beneficial to the clients that are referred into the service. “Our counselling service refers into a variety of partner organisations, such as the lottery funded Wellbeing High Street and BRIO leisure, creating a holistic approach, encouraging an uptake of community services that increase the wellbeing of residents and adding to the effectiveness of the counselling. Councillor Louise Gittins, Cabinet Member for Communities and Wellbeing, said: “Mental health and wellbeing is as important as physical health. Statistics show that approximately one in four people will experience a mental health problem each year. Statistics from MIND show that although the incidence of mental health problems is not increasing, people are facing more worries around money and employment and this is increasing the number of people requiring psychological support. Simon Sandford, (Director) of Healthbox CIC, said: “All the trainee counsellors have to achieve a minimum of 100 hours of client work, meaning we can offer a bespoke, open-ended, holistic approach, whilst helping trainees reach qualified counsellor status. “Without the support of the local authority we wouldn’t have the range of services and support for residents.